Click here to read full anouncement. As many of you have noticed, this site has not been updated as frequently as I would like. The reason – LIFE! I have more on my plate than I can chew and some of my hobbies have had to be put on standby. It saddens me to have to let go of this website after almost one year of existence, so I have instead decided to reach out to the HIM community and ask for your help. English speaking fans to help out with the updates on this website . 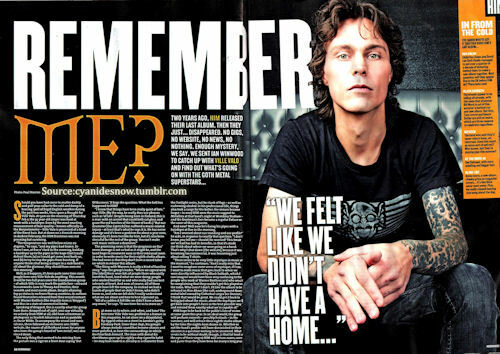 Valo Daily had the opportunity to interview Ville Valo and Mige and have posted the video on their community website. A video for the fans by the fans … view here or click image to view. I just wanted to let you know that I haven´t updated this site lately because I am working and traveling on business. I hope to have it up and running at full speed again after April 15th. 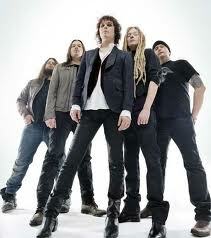 In the meantime you can browse around the HIM Library for lots of other info on the band. For recent updates you can check out their official website or other HIM fansites (view sidebar). Shockhound is giving away a hand-numbered Edgar Allan Poe lithograph designed and autographed by Ville Valo himself. The winner will also receive a Screamworks totebag and CD and a girl’s heartagram tee, HIM Venus Doom tank and a unisex HIM hoodie. For more details click here. Best Rock FM, a national radio station, has a program called ‘The Top 7 at 7′ where fans can vote for their favourite songs to be featured among the top 7. It’s been a while since HIM has been played on Portuguese radio stations and we need every fan (Portuguese or not) to go vote for HIM! All you need to do is pick 3 bands an vote here. Fans Portugueses, vão até à Best Rock FM e votem em HIM para ser rodado no Top 7 às 7! Vamos dar voz aos HIM nas radios portuguesas…vota aqui.